For beginners and improvers. Work with ceramics and vitreous glass, using nippers. Make a stunning mosaic out of a mosaic template, photograph or your original design whilst learning a variety of techniques, from classic to modern to create your own unique mosaic. Mosaic is a slow paced art form and you don't need to be good at drawing as we teach different techniques to copy and transfer a design onto paper or wood base. One day courses are suitable for people who are complete beginners wanting try a taster session to learn the basics of mosaic making and have a fun day. You will create a small piece of 14cm square mosaic using the direct method. In order to be able to complete the mosaic within the given time the design must be simple such as a star, or a flower, or a heart or an object silhouette. All materials will be supplied. We have design templates available on the day. Alternatively, if you would like to work on your own design, please bring this printed out or as a drawing with you. How to grout and complete your mosaic. Make a stunning mosaic out of a mosaic template, photograph or your original design whilst learning a variety of techniques, from classic to modern to create your own unique mosaic! Mosaic is a slow pace art form and you don't need to be good at drawing as we teach different techniques to copy and transfer a design onto paper or wood base. Our short courses take place in a large creative studio and each class has capacity to maximum 8 students so everyone can have individual attention and help from the artist tutor. One day courses are suitable for people who are complete beginners wanting try a taster session to learn the basics of mosaic making and have a fun day. You will create a small piece of 14cm square mosaic using the direct method. In order to be able to complete the mosaic within the given time the design must be simple such as a star, or a flower, or a heart or an object silhouette. After completing your booking you must submit your design ideas for approval before the start day of the course. Paula has been working as a mosaic tutor at our studios for over 7 years, specialising in teaching children and adults with special needs. She has devised and run many of our short courses for adults, which were received with much praise of her patience and ability to encourage everyone's creativity. She has a background in illustration and holds an MA in Design for Sustainable Environments. This course provides a general introduction to ceramics for beginners and further study of new ceramic materials and techniques for previous students. It will outline the main hand-building techniques (not throwing on the wheel) and surface decoration techniques. It is process and material led, rather than project led. This means that students are free to choose their own themes for shapes and decoration. Students are encouraged to bring their own source material for their personal projects but if they need guidance or inspiration this will be given. A collection of ceramics and books for reference will be available. You can book how many classes you want to attend. Secure payment is being made online through Paypal - choose the number of places and click on Buy Now. If you don't have a Paypal account, then choose the Credit/Debit Card option. Alternatively you can send a cheque to London School of Mosaic, Ludham Basement, London NW5 4SF. All levels welcome. Work with ceramics and vitreous glass, using nippers. Creating portraits in mosaic is a great way to pay homage to a person of historical importance, an important family member or to celebrate a person in our local community. Portraiture is a repeating genre in Roman, Greek and Byzantine mosaic including portraits of Emperors, depictions of gods and goddesses, and later on Christian themes. The durability and strength of mosaic created a long-lasting art-form viable for the representation of power, belief and aesthetics. Students will learn how to systematically design and make a portrait with mosaic tiles, using ceramics and vitreous glass tiles. Thinking about abstraction while at the same time paying attention to detail will enhance the student's ability to make quick and refined artistic decisions. The course delivers technical, design and analytical skills to make a well designed and recognisable portrait in mosaic. Silvie has worked with our studio for more than 10 years on commissions and public works. Her particular expertise is to teach figurative mosaic, in particular portraits. She studied painting at Wimbledon College of Art where she completed her BA in Fine Art, and is also currently completing a PhD in Geography. Payment method: Payments are being made through Paypal - choose the number of places and click on Buy Now. If you don't have a Paypal account, then choose the Credit/Debit Card option. Alternatively you can send a cheque to London School of Mosaic, 181 Mansfield Road, London NW3 2HP. For all levels. Beginners and improvers are welcome! Work with ceramics and vitreous glass, using nippers. Make a stunning mosaic out of a mosaic template, your original design or photograph whilst learning a variety of styles and techniques. You will learn the basics of mosaic making using the direct method (directly onto a surface), and exploring the rules of mosaic. On this course you will complete a mosaic of size 20cm x 20cm which is a good size to learn all skills involved in the direct method and complete your piece on time. The direct method allows you to make mosaics at all sizes for interiors. We have a large range of unglazes ceramics and vitreous glass tiles in many colours, including recycled materials. You are also welcome to bring in your own found objects or tiles to use. You do not need to be especially good at drawing for this course as full tuition and help is available. 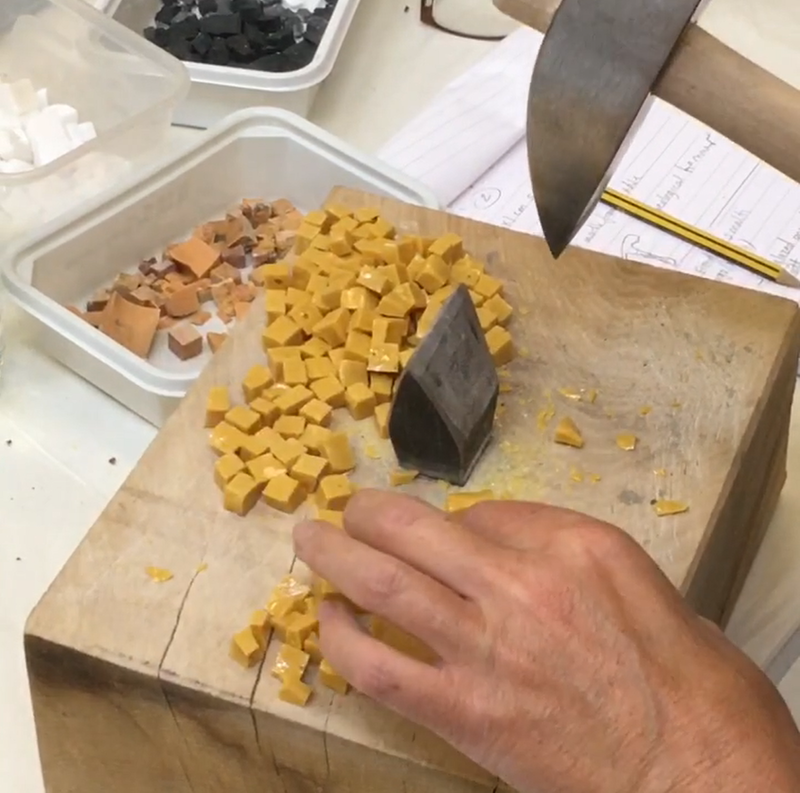 Participants from all levels of skill are also welcome to join this course and practice their mosaic making skills at our well equipped studio, and receive technical advice from our mosaicist tutors. How to apply basic techniques of andamento (mosaic flow) into your work. How to grout and clean your mosaic. Secure payment is being made online through Paypal - choose the number of places and click on Buy Now. If you don't have a Paypal account, then choose the Credit/Debit Card option. Alternatively you can send a cheque to London School of Mosaic, 181 Mansfield Road, London NW3 2HP. For all levels. Beginners and improvers are welcome! Work with china, crockery and ceramics, using nippers. A chance to explore the techniques of mosaic-making with broken china and ceramics whilst studying one of the world’s greatest artists. Programmed to run this summer at a time when Tate Britain will exhibit some of Van Gogh’s best-known paintings and will focus on how Britain inspired him and in turn Britain’s fascination with Van Gogh: Link to the exhibition. You will make a 305 mm (12”) square mosaic using the direct method in the style of Van Gogh’s work, looking at his unique techniques. A wide range of materials will be available for you to choose from, including patterned china, crockery and glazed ceramic tiles. Demonstrations will be given at every stage by the tutor. You will learn how to design a good mosaic, how to break down the 3-D materials to create the 2-D look you want using hand-held tile nippers, glues and grouts onto a wooden base – all materials included. This weekend course will introduce beginners to the art of mosaic-making and teach you enough to continue on small projects at home afterwards. More ambitious projects can be achieved on other courses at the school. Helen Goodman is a freelance mosaic artist of 20 years and fully qualified teacher, running large community projects on the Isle of Wight and specialising in the use of china. Coming from a background in pattern and website design, she has a BA in Graphics from the University of Portsmouth. Helen has her own mosaics business and runs courses for the local authorities on the island, as well as private courses and is currently working towards solo exhibitions and open studio events. Hammer and Hardie technique using smalti glass. Recommended for those with some craft and previous mosaic making experience, who want an introduction to this traditional technique. You will create a mosaic with Smalti using the traditional tools for mosaic, hammer and hardie. You will learn how to cut and shape the specialist Italian hard glass to create a 20x20cm mosaic to take home (other size options are available). Smalti was used especially during the Byzantine era, ranging from 6th to the 15th centuries, when churches decorated their walls with opulent mosaics featuring mainly icons. Mosaics made during this period can be seen in Italy, especially in Ravenna. Today smalti is a popular medium for large-scale commissions of contemporary mosaic internationally, yet most of the specialists working in this medium are still only located in Italy. Strengths of smalti are brilliance in colour, diversity of surface effects and durability. The course includes all materials apart from Gold tiles, but these will be available to purchase at our school. Giulia worked continuously as mosaic maker in Italy and the UK since Ieaving the renowned Mosaic School in Spilimbergo in 2006. She has worked for established mosaicists such as Gary Drostle, and also developed and consulted on her own commissions nationally and internationally. She recently lead various maker workshops at King's College London, Classics Department. Payment method: Secure payment is being made online through Paypal - choose the number of places and click on 'Buy Now'. If you don't have a Paypal account you must select the Credit/Debit Card option. Alternatively you can send a cheque to London School of Mosaic, Ludham Basement, London NW5 4SF. We have a large range of tiles in many colours, including recycled materials. You are also welcome to bring in your own found objects or tiles to use. You do not need to be especially good at drawing for this course as full tuition and help is available.